Japan’s Citizen Kane, Matsutaro Shoriki: disgraced policeman, newspaper owner, baseball entrepreneur, war criminal, nuclear lobbyist. The great fraudster Gregor MacGregor, who pulled off the greatest confidence trick of all time in the 1820s when he invented an entire country for the unwary to invest in. The assassination of Song Jiaoren, a Chinese nationalist and modernizer, in 1913. The historic background to the current dispute between China and Japan over the Senkaku or Diaoyu Islands. The catastrophic nineteenth-century war that killed most of Paraguay’s population and almost all of its men. The controversy in the Orthodox Church, a hundred years ago, that led to the Russian Czar water-cannoning the monks of a monastery on Mount Athos. And, looking back a bit further, the lessons of the Holy Roman Empire (which lasted from 962 to 1806 CE) for the European Union. There’s a weekly limit of six articles for non-subscribers like me, and that’s already seven. But there are some others that are worth looking at, like the one on the ‘Mardi Gras Indians‘ in New Orleans. The Nobel Prize in Literature for 2012 was awarded to the Chinese writer Mo Yan, who—in the words of the Swedish Academy, which awards the prize—”with hallucinatory realism merges folk tales, history and the contemporary”. It’s both the history and the contemporary that have made this a controversial award. Mo Yan—a pen name meaning ‘don’t speak’—writes ‘inside the system’ of authoritarian Communist Party rule in China, avoiding the sort of criticism of the government that has led other Chinese writers into exile. This is why the award is contentious in contemporary cultural politics: Salman Rushdie, on his Facebook page, called Mo Yan a “patsy of the régime” for refusing to sign a petition of other Nobel laureates calling on the Chinese government to release Liu Xiaobo, who won the Peace prize in 2010. But other writers have also observed that Mo Yan’s vision of twentieth-century Chinese history is problematic. His early novel Red Sorghum, set in the 1930s and 40s “portrayed a version of Chinese life under Japanese occupation that was radically at odds with official Communist accounts” (and he got into trouble for it); but when his century-spanning historical panoramas reach the period after the Communists themselves took power, they’re much more careful not to offend: no words for the dead of the ‘Great Leap’ famine of 1959–62, or the Cultural Revolution. Perry Link, in an article in the New York Review of Books at the start of December, outlined both the contemporary politics of the award and the problems with Mo Yan’s version of history, asking “Does this writer deserve the prize?” In response, Charles Laughlin and Pankaj Mishra, from different angles, have defended Mo Yan—or at least, offered some thoughts to give his detractors pause; more recently, Link has answered them. The debate is worth a read for anyone who’s interested in the intersection of politics, literature, and history. Here’s a wonderful image that one of our seminar speakers for next term, Leanne McCormick, has sent us to use in the poster for her seminar—which has the title Filthy little girls: women and public space in Northern Ireland during the Second World War. You can find more details about next term’s seminar series here. The offices of the Nazi newspaper Der Stürmer in the Free City of Danzig, circa 1935. The anti-Semitic poster in the window reads ‘Die Juden sind unser Unglück!’ (The Jews are our misfortune!). Click image for source. It’s always worth reading Timothy Snyder’s review articles in the New York Review of Books. The latest one is entitled ‘Hitler’s Logical Holocaust‘, and books under review include Donald Bloxham’s The Holocaust: a genocide as well as other works in German, Polish, and French. Links to more of Snyder’s articles in the NYRB can be found here. Ideal for snoozing on, too. The ones I was using this week were marked with a brownish-yellow dust down their centre, where the spine of a bound volume lies—possibly crumbling paper*, more likely dried-out and decaying glue. They also—and this is why I’m actually posting about them—looked just like bits of soft furnishings from a 1970s caravan, especially under the fluorescent desk lamp. They triggered a kind of reverse Proustian reaction where I could almost smell the damp grass, aluminium, and primus stove of childhood holidays. For a while, I was lost in memories of swingball and travel sickness and all the other things that made caravan holidays so er memorable. *For more information about paper decay than you will ever need (unless you’re a professional archivist), check out this page from the Library of Congress and this one from a company that makes archival materials—and has, appropriately, retained a ‘1998’ look worthy of the Internet Archive for its own website. There’s also Wikipedia, of course. The best bit about being in the archives is that you stumble on all kinds of stuff that you weren’t looking for: the ‘pleasure of learning singular things‘. Today, for example, at the end of the afternoon, I was looking through an entire microfilmed volume of bound archival documents for what proved to be a single uninformative letter about refugees in French mandate Syria. To find it I spooled through document after document, pausing just long enough on the first page of each to check the bit on the left-hand side saying ‘A/S.’, for au sujet de, or ‘Re:’, and telling you what’s there. When I found myself looking at a letter about un scandale tripolitain—a scandal in Tripoli, Lebanon—I had to read through the whole thing, and the attached cutting from a Tripoli newspaper. I was richly rewarded. There has just occurred at Tripoli a scandal which part of the Greek Orthodox community has, unfortunately, seized on as a reason to rebel against their bishop, who is reproached with having compromised the dignity of the church in an adventure of a very particular character. Monsignor Geha had been linked in a very warm friendship, whose purity some doubted, with a young man of the town whose reputation—rather like that of the prelate himself—is already well established. The public would surely not have concerned itself with these practices, which are common currency […], if the young Levite in question, probably anxious to draw a profit from these relations, on the nature of which I won’t venture to comment, had not suddenly feigned a virtuous indignation, proclaiming that his pastor had attempted to interfere with his innocence and showing off a jar filled with alcohol which contained a piece of ‘that part which is bound to chastity’, as a local journalist put it—a piece seemingly detached by way of an exhibit for the prosecution. De Martel’s own unillusioned opinion was that the whole business smelled of ‘blackmail and machination’, but that the bishop’s ‘dangerous frolics’ were a gift to his enemies—who weren’t philosophical enough simply to observe, with the High Commissionner, that ‘sinners cover the earth’. Trouve d’obstacle à ses desseins ! Que d’ennemis lui font la guerre ! Où se, peuvent cacher tes saints ? Les pécheurs couvrent la terre. letter from de Martel to Foreign Ministry (9 Nov 1934) and enclosure. Ford Madox Ford proposed the page 99 test: “Open the book to page ninety-nine and read, and the quality of the whole will be revealed to you.” This is the inspiration for an excellent books blog run by Marshal Zeringue, who asks authors to tell him about their books, starting with page 99. The blog often covers history books—as I write, the current post is about Jennifer Jensen Wallach’s How America Eats: A Social History of US Food and Culture. Wallach talks about “the paradoxical fact that European American eaters have been willing to embrace the foods of members of various racial and ethnic groups but generally reluctant to bestow first class citizenship on the creators of these cuisines”. Not on page 99 of her book, though: that’s about refrigeration in the meat-packing industry, and she sounds a bit embarrassed about it. 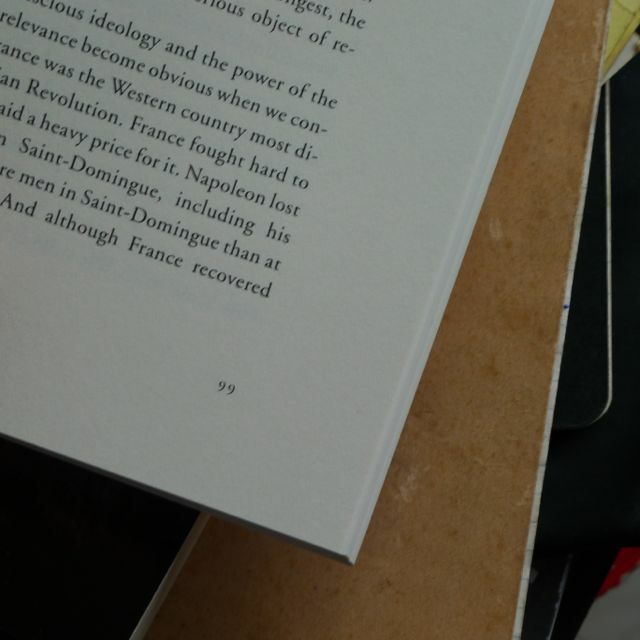 Michel-Rolph Trouillot’s ‘Silencing the Past: Power and the Production of History’ passes the page 99 test.